It’s Been a Long Winter for Nebraska Cattle Producers: What’s Next? 3-month outlooks show wet conditions could continue over the next three months, however, more recent shorter-term forecasts show warming could be on the way over the next 30-days. The most recent Seasonal or 3-Month Temperature and Precipitation Outlooks released by NOAA’s Climate Prediction Center on March 21, 2019. The Outlooks are updated monthly on the third Thursday of the month. Even as flood-weary Nebraska livestock producers and farmers go through the daunting task of rebuilding from the devastating losses to many farms and ranches, there are; at least some heartening signs of recovery and welcome relief. “From a cow/calf standpoint and livestock in general, it’s been a tough winter here in Nebraska. Last fall we had moisture and it continued into the first of the year. It’s been a long winter, then on one end of the state: it was a blizzard. Then on the eastern part: rain and flooding. Now, right in the midst of calving, just finding good dry ground – has been a challenge,” said Dr. Rick Rasby, Ph.D., Associate Dean, University of Nebraska Extension; Lincoln, Neb., as Nebraska continues to rebuild after historic flooding in March after an already tumultuous El Niño winter. Even before the blizzard and flooding, producers were challenged by how long they had to feed hay, and contend with mud, snow, low wind chills. Rasby did say, however, there is a recent positive development, “the good thing is that FSA (Farm Service Agency) has released CRP (Conservation Reserve Program) which typically you’re not to hay or graze, but they have now opened it up, until April 30th and producers can move livestock to those areas,” said Rasby, noting that usually, those areas would be out of the mud. Much of the flooded area would be closer to river bottoms and near streams – which would not likely include CRP acres. “After April 30th, hopefully we’ll have pastures that would be available at that time,” Rasby relayed. Typically, cool season grasses such as brome; would start then. “The good thing is there’s plenty of moisture, with more this week (through April 6th,) but at least we’re starting to see sunny days,” said Rasby, which will help and get grass growing. “Also, cattlemen and women have had a heartwarming response for donations and continue to get donations to those in need. There are numerous acres of pasture and crop ground that have been covered in sand and debris from the floods, and fences have been impaired. Cattle and acre losses are still being determined,” said Talia Goes, Communications Coordinator at Nebraska Cattlemen. Nebraska Climatologist Al Dutcher explained, “This flood event was purely the result of releasing the equivalent of 1.5 to 5 inches of water into our streams/rivers in a little over 24 hours. Put it this way, because of the frozen ground, we essentially put this much water on a concrete surface.” Additionally, the area most directly impacted at the onset of flood conditions were locations prone to strong elevation changes, deep canyons, and had two to three foot of ice cover on waterways. “I have heard from some that the wet soils were a factor. I say bunk on that idea. This was just a frozen ground event with a deep snowpack that was released from a warm rain event,” said Dutcher, Associate State Climatologist at the Nebraska State Climate Office in Lincoln, Nebraska. 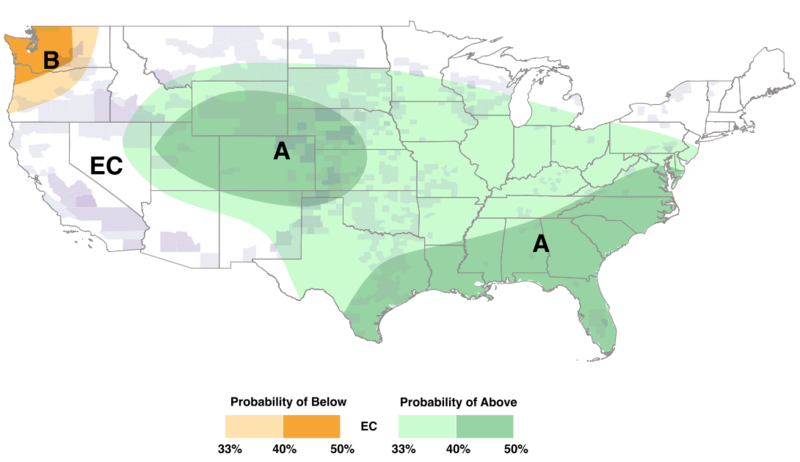 According to NOAA’s Climate Prediction Center and its three-month spring weather outlook (also referred to here as a 90-day Outlook), the highest probability for above-average precipitation is focused in the heart of cattle country. The image above shows the 3-Month NOAA Precipitation Outlook for April-May-June. The highest probability (40%-50%) of above-normal-precipitation includes a large swath of cattle country. Counties in purple have greater than 50K head of cattle or greater. “This will cause continued sloppy and undesirable pen conditions. We’re also in the midst of calving for a lot of cattlemen and women, and those who are calving outside are calving in mud. This is a concern when it comes to the health of the animal,” said Goes. Dutcher confirmed there could potentially be a wet spring in the Cornhusker state and in the central Plains, as well as the possibility of the El Nino season lingering past its original end date. “Precipitation forecasts indicate that wet conditions are likely, with the highest odds assigned to southern Texas, Iowa, and the western interior from central/northern California eastward into the Great Basin. El Niño conditions are in play, and the strong surge of warm water is now making its way to the surface in the eastern Equatorial Pacific,” said Dutcher. “This should help continue to move water vapor northward and interact with weather systems undercutting the Gulf of Alaska ridge,” he added. These weather systems have been entering the U.S. from northern to southern California, then head east/northeast. This track is favorable for the southern and central High Plains region for continued precipitation events, but also signifies less Arctic air intruding into the region and tilts the odds slightly to the above-normal temperature category. “Caution though; 90-day outlooks really rely on the atmospheric pattern when the forecast is made [the third Thursday of each month or in this case March 21st]” Dutcher said. Dutcher went on to say, “the latest monthly [temperature] forecast…is completely different than it was in mid-March [for the three-month or 90-day forecast]”. “The temperature forecast went from below normal from Texas north through South Dakota to above normal temperatures [in the monthly outlook] nationwide outside of the extreme southern Plains,” said Dutcher. “Therefore, when a significant pattern change [is observed] in the same map 10 days apart, you know that a strong pattern change has occurred. Since this one went from cold to warm, it should make the 90-day outlook issued 10 days ago suspect,” said Dutcher. The image above shows the 3-Month NOAA Temperature Outlook compared to the 30-Day Temperature Anomaly Forecast. The two outlooks/forecasts were issued approximately two weeks apart. The 3-Month or Seasonal Outlook is showing expected conditions over a three month period and is not directly comparable to a 30-day forecast. The point to take from the comparison, however, is that the models are likely seeing a pattern change that had the longer outlook been released later could’ve made it shower warmer conditions. A conference call with UNL Extension call Tuesday, April 2nd indicated some damages to low ground in Nebraska. “We know that,” said Dutcher, “But, surprisingly, a lot of our educators indicated soil erosion wasn’t too bad (the ground froze), but secondary roads (logistics) may be the biggest factor going forward.” Dutcher said soil temperatures taken during the morning of April 2nd at the four-inch bare soil depth were 33-45 F (coldest north, warmest south). “Cool season grasses are beginning to grow in Lincoln (Nebraska.) The northern one-third of the state still had frost in the ground from 8-18 inches (above and below that were frost free),” said Dutcher. These wet soils will warm slower, but at least the outlook looks warm for the next two weeks minimum, with widespread temperatures in the 70s next week across the central and southern Plains (and indications of some 80’s). There’s more encouraging news for Nebraska farmers and ranchers. “Not one Educator mentioned [lack of] oxygen levels. So, the biggest issue outside of severe flood prone areas is that fall catchup activities need to be addressed, but from a planting perspective, soil temperatures aren’t really too out of line. As long as temperatures remain above normal, planting delays will be moisture related, not soil temperature related. Personally, I think that the acreage in Nebraska that doesn’t get planted will be much smaller than folks think,” said Dutcher. That’s potentially good news and with the more recent NOAA 30-day forecast showing warming conditions could be on the way, livestock producers may have something to look forward to.